RISE Moldova has analyzed more than 1,000 documents, IP addresses, servers and email addresses that prove the connections between Vladimir Plahotniuc, a Member of Parliament and influential businessman, and the General Media Group Trust that includes the TV channels Publika TV, Prime TV, Canal 3 and Canal 2. The documents also reveal the mogul’s close relations with Finpar Invest SRL, a company with a share capital of nearly half a billion lei, that has as its shareholders and representatives his wife, Oxana Childescu; his sister, Vera Morozan; his godson-in-law Andrian Candu, the Speaker of the Parliament; Ghenadie Sajin, Head of the State Construction Inspection; Andrei Ursachi, son of the former chief of State Protection and Guarding Service; and Cezara Salinski, administrator of Prime Management SRL. Finpar Invest SRL, the oldest company of the Plahotniuc family, was founded in 1993 with the name Center for the Prevention of Crimes and Rehabilitation of Minors with a share capital of 35,000 rubles. In 1998, Oxana Childescu Vladimir Plahotniuc’s wife, became a shareholder with 95 percent of the company’s capital. In 2003, the 95 percent was transmitted to Vera Morozan, Plahotniuc’s sister, and in 2005, the majority shareholders became many offshore companies, represented by proxies (a number of intermediaries controlled by Plahotniuc). That same year, the share capital was increased from 35,000 rubles to 11 million lei. In 2008, the company changed its name to Finpar Invest SRL. In May 2010, the restaurant Ghiocel Dalb SRL and Briat & Co SRL (the company that had owned the Guguță cafes in the Public Garden on Boulevard Ștefan cel Mare și Sfânt in Chișinău), were absorbed by Finpar Invest, whose share capital increased to 207 million lei. Two months later, Ghenadie Sajin, previously the chief of the State Construction Inspection agency and member of the National Political Council of the Democratic Party of Moldova, was appointed administrator at Finpar. Documents obtained by RISE Moldova show that, until the end of 2010, Finpar Invest was controlled by two offshore companies. The first, Finpar Victoria Ltd. (Cyprus), was represented by Olga Dnestrean, the wife of Vladimir Dnestrean, the manager of the security company Argus-Teh SRL. The second, Power Investment LLC (USA), was represented by Andrei Ursachi, the husband of Judge Corina Ursachi and godson-in-law of the former chief of the State Protection and Security Service. From December 2010 to 2014, the only partner of Finpar Invest SRL appeared to be OTIV Prime Real Estate BV (the Netherlands), a company represented by Parliamentary Speaker Candu, and Cezara Salinski, Manager of Prime Management SRL, the only company officially owned by Plahotniuc. Since August 2014, the only shareholder of Finpar has been Asirapal Enterprises Ltd. (Cyprus), which in turn was founded by two other offshore companies (Details, HERE). 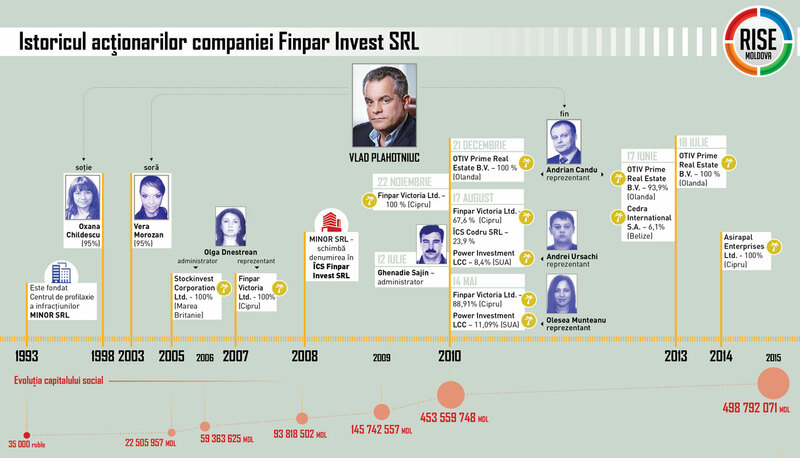 In 2015, Finpar’s capital share amounted to 498 million lei, which is about 10 times more than the official property Plahotniuc listed in his asset declaration. • A warehouse on the Industrială Str. in Ungheni. • Owned land: 10.4 hectares of construction land at 1/8 Tudor Vladimirescu St., acquired in 2010 through a sale and purchase agreement. Andrian CANDU, Speaker of the Parliament: I know it’s a real estate company. There were certain affiliations or transaction relations in 2010… Finpar is in the top 10 biggest companies in Moldova. According to the specialized sites, the server address ns02.finpar.md was located at Mazililor St. in Chișinău. The private security company Argus-S is located at this same address. The advertising agency ANGEL-S SRL also has its premises at 1 Ghioceilor St., in the studio complex Media City, also known as “the media town of Moldexpo.” This agency collected 4.6 million lei from advertising in 2010. According to an agreement for the sale and purchase of shares, signed by Andrian Candu, ANGEL-S became property of OTIV Prime Media BV after it had transferred € 300,000 to the account of the offshore company Media Resources LLC, represented by Dorin Pavelescu, director of the advertising agency Casa Media Plus SRL at 1 Ghioceilor Str. Media Resources LLC has also been represented in many transactions by Cristina Balan, general director of the Moldovan Businesspeople Association. Andrian CANDU, Speaker of the Parliament: We have amended the legislation in such a way that all the media groups in Moldova become very transparent regarding their shareholders. I have high hopes that in the near future we will make our entire media industry transparent from a financial point of view, of the sources of investment, money sources, up to who the final beneficiary is, including the individual. The media industry is as sensitive as the banking sector. From a banking point of view, people must know to whom they entrust their money when they deposit it with the bank, and in the media area that is connected to fair information, people must know who is behind one structure or another. Andrian CANDU, Speaker of the Parliament: About OTIV Prime Holding BV. : I provided legal assistance services with its first transactions. That’s all. The public notary Olga Bondarciuc, who dealt with authenticating the proxies and the sale and purchase agreements, has her office in Plahotniuc’s residence at 1/1 D. Cantemir Bd., in the building of the Global Business Center.